Bill Gowin, founder and director of the Bill Gowin Insurance Agency, is inaugurating a charity drive to help provide for the family of Everlee, a 9 month old baby girl with an undiagnosed illness. 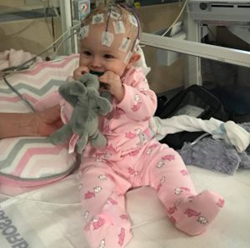 Everlee’s parents Colton and Destanie report that their little girl has regular attacks that cause her to lose oxygen, turn blue, and pass out. “Baby Everlee is an angel, and our entire agency is working to provide her and her family with a helping hand during this difficult time,” said Gowin. Gowin is calling on the local community to help by inviting friends and family members into the Gowin agency to receive a no obligation quote on a new policy. For each referral sent in this way, Gowin has pledged to donate $20 to Everlee’s treatment fund. More information on how to be part of the baby Everlee charity event can be found here: http://billgowininsurance.com/causes/everlees-road-recovery/.